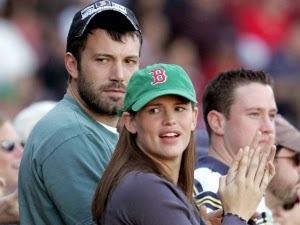 It is common to spot Ben Affleck and Jennifer Garner at Fenway Park. The Red Sox and the Yankees are not playing this postseason, but that doesn't make the rivarly less relevant for some fans, including Ben Affleck. One of the most famous Red Sox fans, Ben Affleck is starring in David Fincher's new thriller, Gone Girl. According to the New York Times, Ben Affleck wasn't willing to wear a New York Yankees hat in a scene where his character has to hide from a crowd. David Fincher thought that a Yankees hat would fit in the movie. But of course, Ben Affleck was raised in Massachusetts and would not wear Yankees gear. Both sides agreed to use a New York Mets hat for the scene. @BenAffleck Thanks for not wearing a Yankees hat in #GoneGirl, Ben! Are you looking forward to this movie? What are your favorite Ben Affleck/Red Sox moments? Who is your favorite famous Red Sox fan? Leave your comments below.